Since the 1970s, the U.S. economy has been sending more and more of its rewards to fewer and fewer people. Once seen as a global exemplar of egalitarianism and middle-class opportunity, America has become the most unequal of developed nations—a land where corporate leaders earn hundreds of times the pay of average workers, and the only population group growing faster than millionaires is the uninsured. Statistics aside, this quarte-century-long trend has changed the texture of American life in ways that threaten our deepest values. Drawing on the best and latest research, the contributors explore issues such as the real story the numbers tell about how America has changed; dimensions of inequality (education, health, and opportunity); causes of inequality, looking past the usual suspects of technology, trade, and immigration; the persistence of racial disparities; the erosion of democracy and community; and inequality as a moral and religious problem. 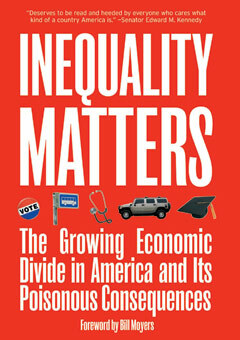 Not just a catalog of inequality’s ills, the book concludes with a plausible and hopeful policy path—beyond redistribution—to a more just and humane economy. David A. Smith is a senior fellow at Demos, a think and action tank in New York City. He previously served as director of public policy at the AFL-CIO and as an aide to Senator Edward M. Kennedy.